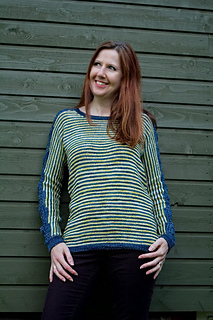 A jumper with all the good things we love in knitting! 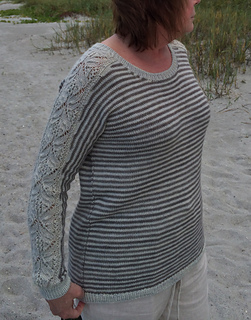 A little bit of Japanese lace (which knits up really quickly), stripes, a really cool construction and at the end a plain stockinette section for mindless TV knitting. Add to that a great and comfortable fit, and the chance to endlessly play with your yarn until you find the perfect color combination. The instructions for the lace inserts are charted and fully written too. XS (S, M, L, XL, 2XL, 3XL, 4XL) - To fit a 28/30 (32/34, 36/38, 40/42, 44/46, 48/50, 52/54, 56/58) bust. Shown in size M, on a 36” bust. 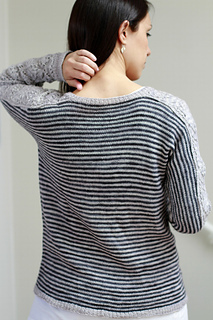 The sweater is intended to be worn with 4” of positive ease, which are built in with each size. Yarn: Tosh Merino Light by Madelinetosh (100% Merino; 420y-100g): 2 (2, 2, 3, 3, 3, 4, 4) skeins in color A (shown in Astrid Gray) and 1 (1½, 1½, 1½, 2, 2, 2, 2) skeins in color B (shown in Dirty panther). Needles: US 2½ (3mm) and US 4 (3.5mm) circular needles. Bust circumference: 33¼ (37¼, 41¼, 45¼, 49¼, 53, 57, 61) inches; 84 (94, 104, 114, 124, 134, 144, 154) cm. Upper Arm circumference: 15½, 16½, 17½, 17½, 20¼, 20¼, 21, 22) inches; 39 (31, 43½, 43½, 50½, 50½, 53, 55) cm. 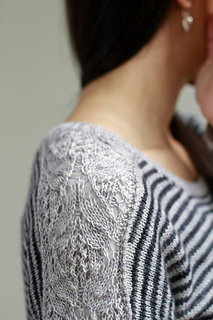 Sleeve length from underarm to cuff: 16 (16¼, 16½, 16, 16, 15½, 15, 15½) inches; 40 (40½, 41, 40½, 40, 39, 38, 38) cm. 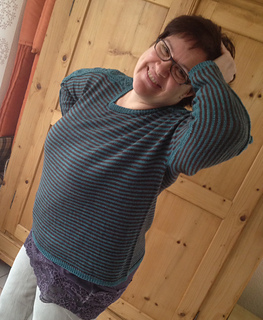 Length from underarm to hem: 17¾ inches; 44 cm. 23 st and 34 rows to 4 inches (10 cm) on US 4 (3.5mm) needles, in stockinette st, after blocking. Please wash and block your swatch before measuring, my pre-blocking gauge was 25 st to 4 inches.